There are almost an infinite number of curved brush specifications. They have been used in many thousands of applications from typical brushing uses that require a unique shape, to sealing or holding products in place during a manufacturing process. Inside Curve brushes have a metal channel along the outside diameter and filaments are pointed inward. 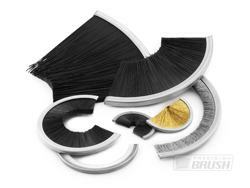 The curved brush, or partial inside disk brush, can be made in any length required. Sometimes the metal channel length is specified in degrees of the circle or in actual measured brush length around the outside diameter. Outside Curve brushes have the metal channel on the inside of the brush with filaments pointing outward. The brush is cut from a disk brush so the length can be any degree of the full circle that is required. These brushes are typically used in a stationary position although they may be secured to a shaft and rotated slowly to separate product or to slow the movement of liquid as it passes the brush.